Happy customers are the beating heart of any company. But who qualifies as a happy customer? Customers that regularly use your product, and are satisfied with the solution? That’s a good start, but I believe there’s more to it. Imagine a customer comes up to you and says: “I absolutely love your product, and I couldn’t go a day without it. In 2 months, I gained 20 new customers thanks to your product, which resulted in $10,000 extra revenue.” Now thát’s a happy customer! If your customer can put a number on it, it’s much easier for them to see the business value of your product. This is exactly the reason why many software & internet companies are opening up their data and insights to their customers, by adding customer-facing dashboards to their software or client portal. Now, what does a good customer-facing dashboard look like? How will your customers really benefit from it? I believe that the best way to learn, is to learn from others. And there are many great examples out there! That’s why we’re starting a blog series called ‘Deep dive in the dashboards’. Every month, we’ll hand-pick a (software) company that has implemented useful dashboards for customers, inside their app or platform. We’ll take a closer look at them, listing the pro’s, con’s, and tips that can help you build customer-facing dashboards yourself. Worldwide, businesses are advertising their products and services on Google with Google Adwords, recently re-branded to Google Ads. They want to make their business findable for the right people. Obviously, marketers & advertisers want to have insights into the performance of their campaigns: spendings, ROI and where to optimize. Most advertising tools have the possibility to customize & export table reports to deep-dive into the numbers, but are usually limited in visualizations. If you’d agree, then Google Ads is definitely the odd one out! The tool includes some surprisingly insightful user dashboards, on top of the standard table reports. In that way, Google Ads enables their users to gain much more insights from their campaigns, and much faster. All without the need for exporting & analyzing manual reports. Let’s look into some examples in more detail. In the ‘Overview’ section, you’ll find a range of charts that show the performance of individual campaigns, or compare the results across all your campaigns. We’re a big fan of their dashboard approach, so let’s have a closer look at what we like so much about them. Gather some inspiration & tips to build great customer-facing dashboards yourself! First of all, the overview dashboard is structured very logically for a user to browse through. It starts with a simple overview of the key KPIs and their evolution, gradually passing on to more detailed statistics. If you want, you still have the possibility to drill down in more detail on a specific topic, such as the search terms, keywords or even locations of your campaigns. What’s more, each chart implies some type of action for you to take. For example, look at the chart with ‘Biggest changes‘ below on the screenshot. In just 1 glance, it shows that you need to take action on your display campaign, as it has had a huge drop in clicks. The chart with ‘Searches’ shows at once which terms people used in their search query that triggered your ad. Advertisers can act upon this directly by adding it as a keyword, or increasing the bid. As you see, these actionable charts really guide the user in their campaign optimization process. It supports them to make better decisions faster. There’s a lot of variation in the chart types being used. Not only simple line charts, but also maps, heat matrices, or scatter plots are being used. And not just for the fun of it. They really selected the right charts that best fit the purpose of the data. For example, look at the auction insights. You immediately understand where your brand is positioned, compared to its competitors. In addition, the ‘day & hour’ section makes the time distribution of your campaigns visually understandable. Users don’t need to put a lot of effort into reading the charts, it all makes sense visually. Extra tip: if you would like to learn more about picking the right chart, this short guide might help you! Dashboards are colorful, which not only makes it nicer to look at. It also highlights the right information that is most important to the Google Ads user. Again, this makes it easier for a client to navigate and analyze what’s happening with their ads. Look at the yellow bars in the ‘Devices’ section. Thanks to the color, you can immediately see that the proportion of clicks & conversions is not equal. If you want to boost conversion, you might want to put even more budget to desktop. Again, this leads to much faster decision-making. Not every Google Ads user has the same objectives. While some might focus on leads, others might focus on direct sales or traffic. In the dashboards, you can easily switch between KPIs. This is a huge value for anyone using Google Ads. You can simply adjust the dashboards to view only what’s most important to you. If you’re a marketer, you probably know the drill of reporting: setting up manual reports, taking exports, creating charts in Excel to use in presentations,… That’s in the past now. Having access to dashboards like the ones in Google Ads helps advertisers save countless hours of time on reporting & analysis. The reports are ready-made, right there in front of them. They don’t even have to leave the Google Ads platform. It’s still possible to dig deeper in the numbers if needed, but these visual charts already provide you with 90% of the information you need. Not only does it gain time, it also supports you in the advertising process. The dashboards guide you to make better decisions on your marketing campaigns. If you don’t know which KPIs or influencing factors are most interesting to look at, these dashboards can be a great starting point for any marketer starting with Google Ads. 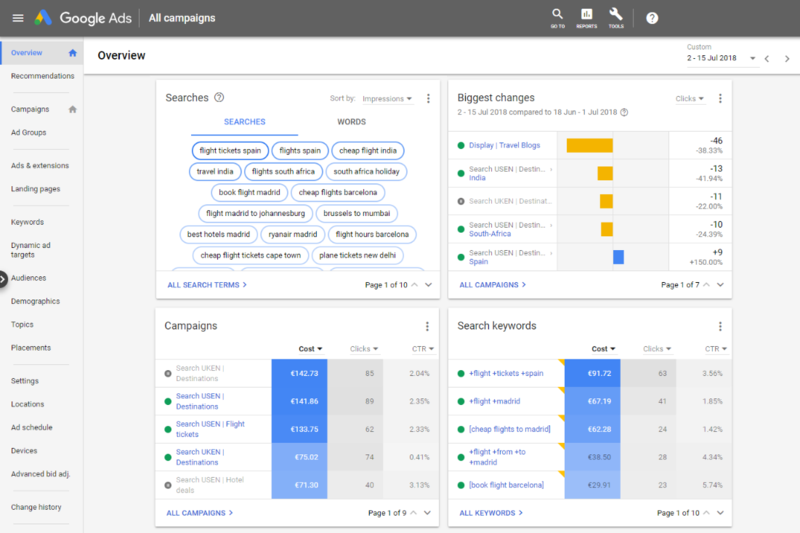 For the Google Ads platform, these dashboards are a valuable add to their software. It allows them to provide their customers with the insights needed to really stimulate growth in a business. It improves the user experience considerably. Users can do their job more easily, more efficiently and much faster. The easier a user finds the insights they need, the happier they will become about the solution. In the end, the dashboards contribute to a loyal, satisfied customer base. Stay tuned for our next episode in September! Are you already sharing dashboards with your customers, as part of your product? We’re still looking for some great examples to share with the community. Whether it’s a fully embedded module, or some custom developed charts. If you’re interested to get featured in our blog series, don’t hesitate to get in touch! 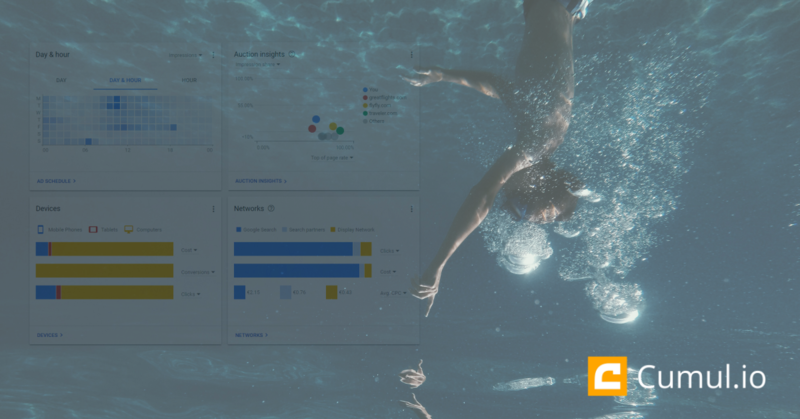 If you’re interested to learn more about adding dashboards to your platform in a fast & cost-efficient way, we’re here for you. You can learn more about Cumul.io’s analytics integration, or simply book a demo and we’ll guide you through.